Here beautiful legs man 3/4. They are suspended in a square metal base whose can be adjusted easily. These legs are perfect to enhance your clothing collections and bring a touch of originality to your windows. Covered with aluminum gray fabrics, they will attract the eye. These man mannequin legs are available in delivery. 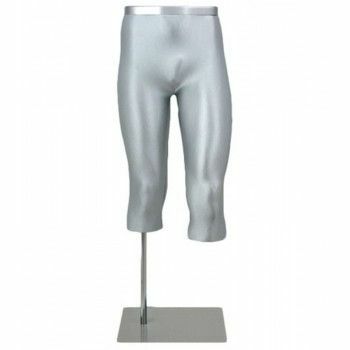 To enhance your shopping, Mannequins Online offers you these wonderful men mannequins legs. This pair of legs man has an attachment to the calf with a rectangular metal base. It is foam rigid polyurethane covered with aluminum gray fabric. Fixing tube is 25 mm + adjusting screw in the right leg.